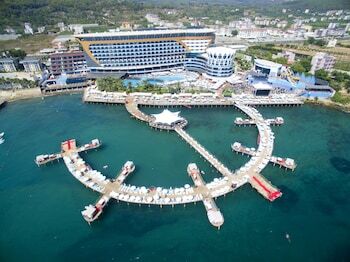 Located in Alanya, Granada Luxury Resort Okurcalar - All Inclusive is in the entertainment district, within a 15-minute drive of Alara Bazaar and Sealanya. Featured amenities include a computer station, complimentary newspapers in the lobby, and dry cleaning/laundry services. Event facilities at this resort consist of a conference center and meeting rooms. Free self parking is available onsite.